Do you see objections on appointment calls as a brick wall that you have to knock down, break through, or scramble over? I’ve seen many sales people charging at objections and meeting them head on. There are answers you can use to overpower objections, but often that approach becomes a battle between you and the prospect. 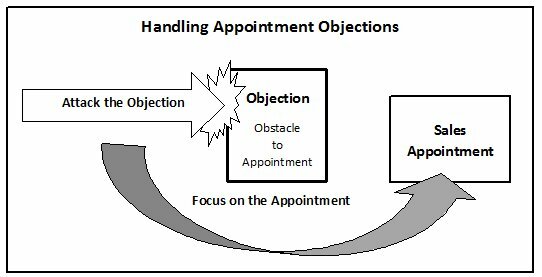 As you answer an objection the buyer raises another objection and builds another wall in the way of you getting to the appointment. You are not trying to close the sale. Remember you are not trying to close a sale, you’re objective is to gain agreement to an appointment so that you can start selling. objection with the aim of showing the customer a different viewpoint. But in most cases the best way to get past the objection, and reach the appointment, is to go around the objection. Keep your focus on the appointment not the objection. Once you adopt this viewpoint you can start to look at how to turn it into actions. The above is a brief presentation from the training course Making Sales Appointment by Telephone. The training presents the proven idea of changing your viewpoint, and instead of attacking objections see them as an obstacle to go around. The objective is the appointment. If you can achieve that objective by putting off the objection, deflecting it, or avoiding it, then why attack it? By taking this one simple change of viewpoint you can really increase the number of appointments you make. And it makes cold calling much more fun, and keeps your motivation and resilience levels high, as your not battling against objections.